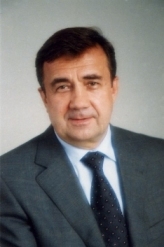 Rector of V.N.Karazin Kharkiv National University, Doctor of Sociology, Full Professor, Corresponding Member of the National Academy of Sciences of Ukraine and the Academy of Pedagogical Sciences of Ukraine. For many years V. Bakirov has been actively participating in scientific and pedagogical work in higher school. In 1990 he started and headed Ukraine's first university school of sociology. Since 1998 he has been Rector of V.N. Karazin Kharkiv National University. In his scientific research V. Bakirov focuses on the analysis of the role of classical universities in the society's intellectual development, on the study of the peculiarities of classical university education in terms of globalization and post-industrial challenges. Widely known are V. Bakirov's scientific works on the communicative paradigm of the development of university democracy, innovative processes in higher school, informational and communication technologies in higher school. With his efforts and energy V. Bakirov is greatly contributing to the development and improvement of education and science as Head of the Board of Rectors of Kharkiv region's Higher Educational Establishments of the III-IV levels of accreditation, President of the Sociological Association of Ukraine, President of the Kharkiv Branch of the Junior Academy of Sciences, Member of the Presidium of the Higher Certification Committee of Ukraine, Member of the State Accreditation Committee, Member of the Department for Social and Economic Sciences of Ukraine's Committee for State Awards in Science and Technology. V.S. Bakirov's achievements in science and education have gained public and international recognition. He has been awarded the Order of Prince Yaroslav Mudry of the V Class; has the honorary title of the "Honored Worker of Science and Technology of Ukraine"; Honorary Doctor of O.Honchar Dnipropetrovsk National University, has been honoured with the Academy of Pedagogical Sciences of Ukraine's Medal "K.D. Ushynsky" and the Bulgarian Academy of Sciences' top-level distinction the Maryn Drynov Medal on the Ribbon. Honorary Citizen of the City of Kharkiv. Full Professor at the Applied Sociology Department. Doctor of Sociology - 1999, Full Professor - 2003, PhD - 1989, Associate Professor - 1996. Specialist in Organization and Management Sociology, Management Counseling, Social Policy. Developed an original theoretical approach to organization defetishizing. Research interests: sociological examination of social, economic and managerial problems, social service management, social development of organizations and territories. Larysa M. Khyzhniak graduated from the School of Economics at A. M. Gorky Kharkiv State University majoring in "Political Economics", completed her post-graduate studies and defended PhD and then Doctoral theses. Combines teaching and research activity. Participated in the following projects: "Improvement of Social Protection System in Ukraine" (under the aegis of TACIS, 1997); "Contributing to Social Services Reform in Ukraine" (under the aegis of Department International Development, 2004-2006); "Comparative societal integration of Turkish and similar minorities. Institutional Strategies in INTAS and CIS countries" (under the aegis of INTAC Foundation, 2005-2007) and others. Larysa M. Khyzhniak is a member of Editorial Boards of four research and vocational journals in Sociology. She also participates in appraisal of research and teaching staff: she is a member of Д64.0512.15 V. N. Karazin Kharkiv National University Expert Examining Board on conferring Doctoral and Postdoctoral degrees in Sociology; a member of Expert Council of Ukraine Supreme Attestation Commission on Philosophical, Sociological and Political Sciences. 2007-2009 - juror on the All-Ukrainian Students Competition on Sociology and All-Ukrainian Competition of Students Research Papers on Sociology. Post-graduate students' supervision - 6 got PhD degrees in Sociology and Public Administration. 2007 -member of the Ukrainian Sociological Association Board, Head of the Institutional and Management Sociology Research Committee. Academician of the Ukrainian Higher School Academy of Sciences. Larysa M. Khyzhniak is the author of 189 research and research and methodological materials including 1 monograph, a contributor to 5 collected monographs, a section in a textbook. In 1975 graduated from O. M. Horkiy Kharkiv State University. Scientific interests: sociology of advertising, sociology of consumption, sociology of communication, sociology of the elite. At present Lysytsia N. M. is actively participating in a research project studying the sociology of the economic elite. Member of Academic Boards for conferring doctoral degrees in sociological sciences, Member of Editorial Boards of specialized scientific journals. Awarded with honorary diplomas of the General Department for Education and Science of the Kharkiv Region State Administration, distinctions of the Ministry of Education and Science of Ukraine: "For Excellence in Education", "For Achievements in Science". Lysytsia N. M. has supervised 8 candidate's theses which were successfully defended; published about 200 scientific and methodical works including 12 monographs and manuals. Assistant professor. Major research issues: contemporary sociological theoretizing; marketing research; social models of development; innovative communicative technologies; branding. Graduated from the School of Sociology at V. N. Karazin Kharkiv National University in 2004 and began a postgraduate course in the same year. At present she is working at a thesis "The communicative mechanism of stigmatization as a means of modulation of the negative image of a profession". Scientific interests: sociology of professions; theory of communication, modern communication technologies, technologies for making multimedia presentations; quality methods of research. Phd (Sociology), Associate Professor, Head of the Methodology Board of the School of Sociology. Education: graduated from the School of Sociology at V. N. Karazin Kharkiv National University in 2003, part-time branch of the School of Economy at V. N. Karazin Kharkiv National University in 2003, took post-graduate course at the Applied Sociology Department at V. N. Karazin Kharkiv National University in 2003-2006. In 2006 defended his candidate's thesis in sociology on the subject of «Tendencies of the development of sports under conditions of market transformations». The courses: Sociology (at the Schools of: Radio-Physics, Physics and Technology, Physics and Energetics, Computer Sciences); Sociology of Sport (in the 5th year at the School of Sociology); Contemporary Sociological Theories (at the part-time branch of the School of Sociology); Social Statistics (seminars, 2nd year at the School of Sociology); Economic Sociology (seminars, 3rd year at the School of Sociology); Organizational Dynamics (seminars, 5th year at the School of Sociology). Directions of research: marketing and sport, sport management, sport fashion, sport engineering, conflicts in sport, corporal sociology, sociology of recreation. Research interests: Sports Sociology, Communications in Sports, Theoretical Sociology, Leisure Sociology, Fashion Sociology, Service Industry Sociology, Travel Industry Sociology, Systemic Approach to Sociology. Publications: over 50 research publications. Associate Professor at Applied Sociology Department of V.N. Karazin Kharkiv National University (2006). Completed a training course for Public Relations Specialists and Trainers at the European Journalism Center (2003-2005). Participant and co-organizer of international conferences, in particular on matters of tolerance and intercultural communication. An observer at the US Presidential Elections (2008). Founder and Director of the University Public and Press Relations Center (2002-2006). Participant of the Partnership Program between Kharkiv Center for Gender Studies at V.N. Karazin Kharkiv National University and the Women's Studies Program at Iowa State University (USA). http://www.las.iastate.edu/WSP_KCGS_Partners/russian/homepage.htm. PhD (Sociology) - 2004, Merited Educator of Ukraine. Author of over 20 research papers, research and methodological materials, co-author of "Public Relations in Business" textbook; has designed and teaches courses in "Public relations", "Theory of Communications", "Business Ethics" and others. Scientific supervisor of the University students team - winner of the second and third All-Ukrainian Students PR-Projects Competitions (2009,2010). Phd (Sociology), associate professor. Major research issues: social conflicts; social tension; social alterations; social consolidation; deviant behaviour; social communication; social techniques and approaches; marketing communications and research. senior research worker, Phd (Sociology). Scientific interests: sociology of mass communication, social communications, sociokul'turnye researches, communicative management. PhD of Sociology, senior lecturer in applied sociology. Research interests: theory and history of sociology, tolerance, migration processes in the world, risk society, globalization, electoral sociology, methodology and methods of sociology. Author of more than 40 scientific publications.